Oleksandr Kolchenko, date unknown. 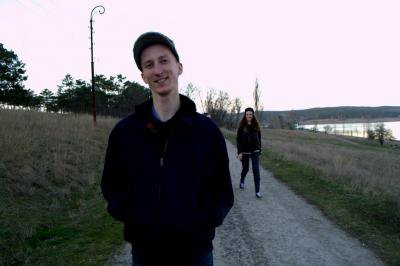 This November, Crimean anarchist Oleksandr Kolchenko is celebrating his 28th birthday in a prison in Chelyabinsk, in Russia’s Ural region. The story of Kolchenko’s arrest and trial reminds me of reports by Luke Harding about Russia during the 2000s. But what happened to Kolchenko, and Crimean film director Oleg Sentsov, is actually a story of how the Russian Federation began to act outside its borders — and the bounds of international law. Oleksandr studied in Taurida National University, Simferopol. In Autumn 2011, when former Ukraine’s Minister of Education Dmytro Tabachnyk introduced fees for a range of activities at universities, Kolchenko, together with other anarchists and anti-fascists, protested against the commercialisation of education in Ukraine. Kolchenko and his friends, their faces covered, carried the red-and-black flag. Later, he participated in protests against changes to Ukraine’s Labour Code, which would have restricted the rights of working people, as well as taking part in feminist actions, environmental events and anti-fascist demonstrations. After Russia’s annexation of Crimea, Kolchenko was accused of belonging to the Ukrainian far-right organisation Right Sector. Initially, it was hard to say whether this was irony or a joke, a lack of political education or just Ukraine’s weak party system, which still can’t set firm ideological boundaries for political parties. The answer, however, turned out to be rather simple. Kolchenko and Sentsov were accused of belonging to a “terrorist group” that had allegedly set fire to the Simferopol offices of the Russian Community in Crimea organisation and the United Russia party. This, according to investigators, was the work of the so-called “Sentsov group”, whose leader was declared to be the Crimean director. Representatives of the Russian authorities, who had occupied public administration buildings in the city, started their tried and tested scenario for neutralising political opponents — they accused them of terrorism, thereby placing the security of Crimea’s residents in doubt. Kolchenko, just like Oleg Sentsov, was tortured, though he didn’t reveal this in the beginning. At the initial interrogation session, which was not entered into Kolchenko’s arrest file, he was beaten in the face and body. He didn’t talk about this because, on finding out what happened to Sentsov, he decided that the violence he’d experienced was insignificant and not worth talking about. 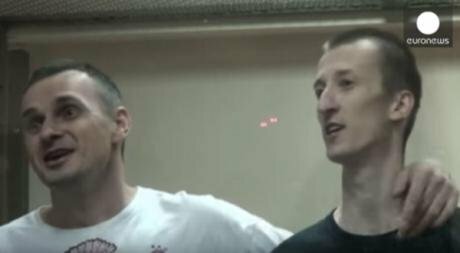 Oleg Sentsov and Oleksandr Kolchenko sing the Ukrainian national anthem during sentencing in August 2015. Source: Euronews / Youtube. Court sessions followed, and in August 2015 the North Caucasus Military District Court sentenced Oleksandr to 10 years in prison, and Oleg - 20 years. After an appeal filed by the defendants’ lawyers in 2015, the Supreme Court of the Russian Federation declined it. Russia considers Kolchenko and Sentsov Russian citizens, although neither of them surrendered their Ukrainian citizenship, nor did they take Russian passports. Kolchenko himself on several occasions has affirmed he is a citizen of Ukraine. Indeed, as an anarchist, he had to accept the primacy of law when he confirmed his citizenship in court. This meant foregoing his principles and convictions, and putting ideology to one side. This is the reality in which Kolchenko found himself. Kolchenko’s anarchist and anti-fascist views have become an important example of how, if you’re left-wing in Ukraine, that doesn’t mean you’re a separatist or abetting the Kremlin. The Ukrainian Institute of National Memory is currently trying to re-write Ukrainian history — for the most part, only ultra-nationalists as heroic examples will remain. This year, Nikita Kadan, a Ukrainian artist, created an exhibition at Lviv’s Center for Urban History called “(Un)named”, about contemporary Ukrainian historical memory. The exhibition was based on Kadan’s work with archive photographs of the 1941 pogrom in Lviv and the 1943 Volyn tragedy. Kadan says that the discourse of the Institute of National Memory only concerns a number of “Bolshevik-Polish bands”, it lacks information about the crimes of Ukrainian military formations during World War Two. There can’t be Ukrainians who committed crimes, their line goes, and if there are, they weren’t true patriots. You can’t be a true Ukrainian if you aren’t a patriot. In investigative detention in Moscow, Oleksandr Kolchenko wrote that he had been re-reading Mikhail Bakunin, Lesya Ukrainka and Ivan Franko. He doesn’t always receive letters, but those he does - he answers. Given that the range of topics you can speak about in prison is restricted, even the names of books or bands (written, for example, in English), aren’t permitted. As an anarchist from Crimea, Kolchenko isn’t often mentioned by politicians or the media. But Kolchenko demonstrated more democracy in his social activism and position on events in Ukraine than those who constantly speak about it today.